Welcoming remarks by Angel Gurría, OECD Secretary-General. As Secretary-General of the OECD, and as a Mexican, it is a great honour for me to welcome Mexico’s President-elect, Enrique Peña Nieto. President Peña Nieto is the leader of a new generation of Mexicans that have set an attainable goal: to make Mexico a success story. 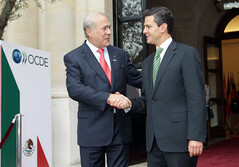 His path to the presidency of the Republic has been founded on results, as clearly shown during his six years as governor of Mexico State — a state that has over 15 million inhabitants making it larger than 20 of our 34 member countries here in the OECD — in a term of office that was distinguished by scrupulous fulfilment of his 600 campaign promises. Today, Enrique Peña Nieto has won the presidency of Mexico with a solid mandate, having obtained over 3 million votes more than the next candidate, or his main rival in this case. The President also will also take office with strong support in Congress. Although he does not have an absolute majority, he does have a reasonable margin to introduce key reforms, which have been put off for many years precisely because of the lack of political consensus. This is great news, because Mexico can’t wait any longer. In the agreement we signed just a few weeks ago, for the OECD to support Mexico in designing public policies, we highlighted the urgent need for changes in the country; and we committed ourselves to working intensively to promote those changes. Mexico is a country of some 115 million enthusiasts; a young and dynamic nation, open to the world, with a stable macroeconomy, sound public finances, well-capitalised and well-regulated banks, and a capacity for hard work. The appropriate, well orientated and sequenced combination of these factors could enable our country to grow faster and, particularly, on a sustained basis; and help reduce the major inequalities that weigh so heavily on it. But Mexico will only be able to exploit its strengths and potentials if it successfully addresses its structural challenges, its education, its productivity, its competitiveness, and its rule of law. What are the main challenge to be overcome? What is Mexico’s role in the international arena? This is precisely what we are going to hear directly from the President-elect. Thank you, Mr. President, for having come here today to share your vision with our distinguished guests; for choosing the OECD to send an important message to the international community; and for having given up (and I want to stress this for all our guests), for having given up the entire morning to work with our experts on issues such as the economy, education, energy, innovation, and other issues that are fundamental for the future of the country. We will continue working to produce our recommendations for Mexico. A few weeks ago we presented you with our first draft, putting forward the main public policy issues on which we will be working in the coming months. By November, or early December with the new administration in place, we will deliver a public policy document, which will also serve as a basis for a major public policy seminar to be held in Mexico City in January, with participation from other international organisations, the new government, civil society, the private sector, labour unions, etc. Now, without further ado, I would like to invite the President-elect of the United Mexican States, Enrique Peña Nieto, to address us.